The James Russell Lowell Elementary School, being part of a multicultural community, strives to create a climate of safety, mutual respect and equity. By doing this, we utilize the strengths of our many cultures to enable all of our students to reach their potential. In order to accomplish this goal, we have created and maintain a school climate where teaching and learning is priorities. 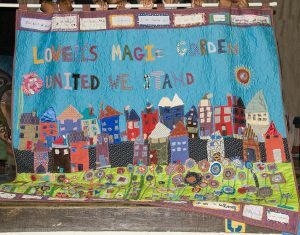 The vision of the Lowell School is to create an educational climate of safety, mutual respect and equity. Lowell School is a community of children, educators and parents working together to create a happy, safe learning environment. Our child-centered approach fosters free thinking, curiosity and risk taking. In order to accomplish this goal, we will mature, strengthen, and expand the existing partnerships of students, staff, parents, and community. Our community’s foundation relies on the trust and respect we give one another. Through site selection we attract teachers, largely from our pool of student teachers, who share our vision. The James Russell Lowell Elementary School, being a part of a multicultural community, strives to create a climate of safety, mutual respect and equity. By doing this, we utilize the strengths of our many cultures to enable all of our students to reach their potential. In order to accomplish this goal, we have created and maintain a school climate where teaching and learning is priorities. We commit ourselves to providing educational, social, psychological and medical supports to meet the needs of each child. We commit ourselves to take each child from where he or she is now and to move him or her forward. We commit ourselves to offer a stimulating environment where all members of the school family will learn, continue to grow and strive for excellence. We commit ourselves to nurture, strengthen and expand the existing partnership of students, staff, parents and community. These commitments are the cooperative responsibility of administration, faculty, support staff, community, families and students. It is our goal to prepare each and every student for success in the 21st century.